Our kitchen counter is an area I like to keep fresh and simple. Whenever my counters start to feel too cluttered, which it always seems to end up that way, I clear everything off and give it a fresh start. Today I thought I'd share some of my favorite things that are on our kitchen counter right now. Let's start with THIS galvanized caddy that I got from Hayneedle. I think it looks so cute holding a couple small plants in the first two cans and I scrub brush and dishtowel in the last, making it practicle to have right next to the sink. When we had a causal dinner party at our house not too long ago, I filled this caddy up with utensils; spoons, forks and knives, each in their own compartment and it really work out great. 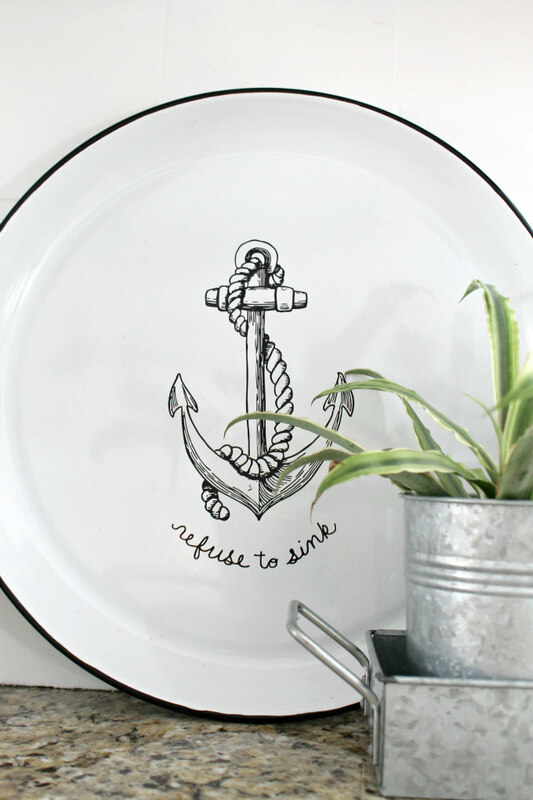 Next up is THIS anchor enamel tray from Birch Lane. Not only does it look cute sitting on my counters, but you wouldn't believe how much I use it. If I'm taking a snack downstairs to my boys or displaying cookies for arriving guest, I always reach for this tray. As for my paper towel holder, I thought out of the box a bit and now use a bucket. 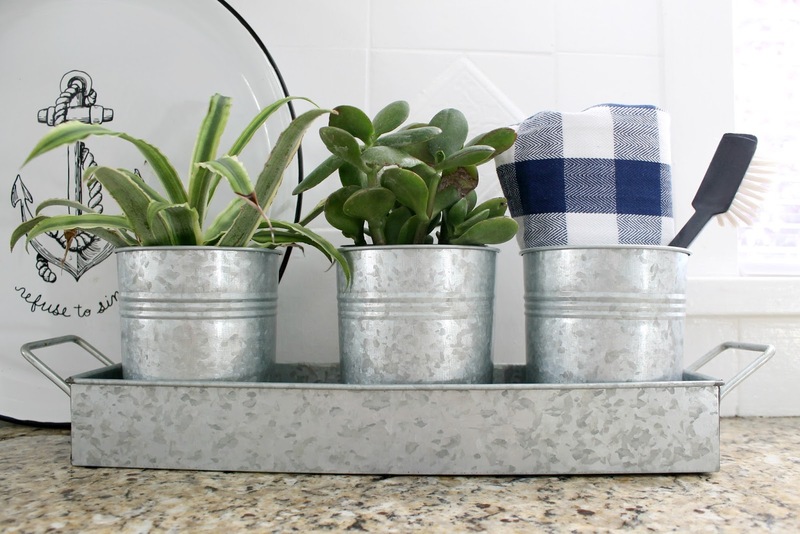 I use paper towels A Lot and so I like to have them easy to get to, but I also wanted a change from the typical paper towel holder, so I descded to use a metal planting bucket instead. I've just hot glued a house number 5 on it to give it some added charm. My most favorite thing on our kitchen counter though has got to be this water fountain. It gives off the most calming water tinkling sounds that can be heard throughout our living spaces. 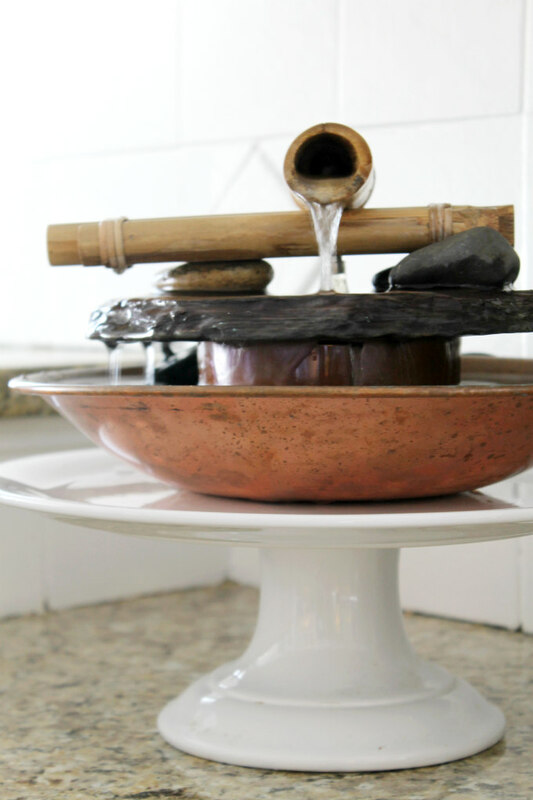 I actually created this fountain myself by using THIS bamboo spout that comes in a kit. You can place it over any bowl or pot you wish. I had an old fountain that didn't work anymore, so I placed the new bamboo spout on top of it. 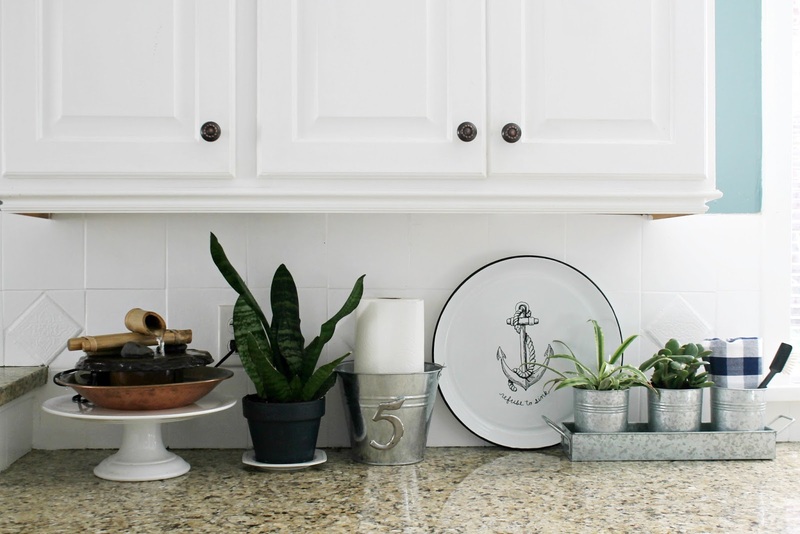 What favorite things do you keep on your kitchen counter tops? And remember you can always come find me on Instagram, Facebook and Pinterest. The counter looks airy and fresh. 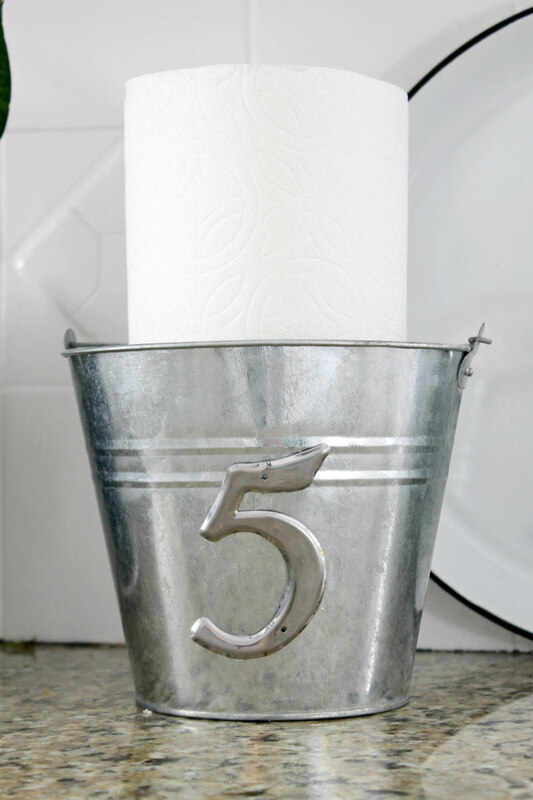 I love the paper towel holder idea. I really love your blue and white kitchen makeover. The blue is perfect. I couldn't agree more.. so yay! I love your paper towels in the bucket. I keep my kitchen flatware in a two-can caddy. Just easier to get to and put up after washing. I too love the sound of water. Nothing more soothing! Ah, the simple life. Hhhmmm, I might steal your payer towel in a bucket! Luv!